This article explores the intersection of art education and place-based education as a means of developing ecological literacy. The author advocates for the development of a model of place-based art education, one that integrates the real world, community-centred learning of place-based education with the affective, subjective orientation of art education. Drawing inspiration from the work of environmentalists and eco-artists alike, this model is seen as a way for art and environmental educators to create powerful and memorable experiences for their students by bringing self and community into dialogue with place. Examples of place-based art education are cited, as is an introduction to an ongoing research study involving this model. In recent years I have been on a professional and personal journey to explore the role that art education can play in developing ecological literacy. Based on a desire to find a more socially relevant role for art education, I have been investigating how the visual arts are being used to raise awareness of and engagement with environmental concepts and issues. Inspired by a generation of artists who are using their work in this way, I have been intrigued to discover how art educators can contribute to the emerging field of environmental art (also referred to as eco-art) and environmental education. Following the trails of art educators who began discussing concepts of eco-art in the mid 1990s has provided a solid starting point, and led me on enriching treks through a variety of terrain in art education, environmental education, and outdoor education. Interestingly, these forays have all led to a similar destination, one that grounds learning about the visual arts in a place-based approach to education. The intention of this paper, therefore, is to draw a road map of the crossroads of the disciplines of art education and place-based education, hopefully encouraging other educators to explore this new territory in the pursuit of ecological literacy with their own students. Place-based education is a relatively new addition in discussions of curriculum and pedagogy in North America, despite its roots in ancient practices; up until the Industrial Revolution, education was grounded in its local place not by choice, but as a means of survival. Some communities have maintained a close connection to place through their schools, but in many more (particularly in industrialized nations) these connections have been greatly reduced, if not entirely lost, over the last century in the shift towards curricular standardization, national achievement tests, and mass-produced curricular resources. So while place-based education might have been implicit in curriculum in the past, it is seen as an innovative approach by many today. Integrating place-based education with art education promises an innovative approach to ecological and environmental education, one that balances the traditional roots of these disciplines (found in the cognitive, positivist approaches of science education) with the more creative, affective and sensory approaches of art education. In this, art education offers a dynamic way to increase the power and relevancy of learning about the environment by providing an alternative means of furthering learners’ ecological literacy. This assertion has supporters from within traditional factions of environmental education: for example, Orr (1992) argued that ecological literacy will not be instilled in children unless it is integrated into a wider variety of subject areas, including the arts. The need for more arts-based, affective approaches to environmental education has been echoed by many others (Graff, 1990; Adams, 1991; Lindholdt, 1999; Gurevitz, 2000), and has recently been made policy in Ontario with the acceptance of a cross-curricular approach to environmental education by the Ministry of Education (Working Group on Environmental Education, 2007). I share with these authors a belief that the affective and subjective orientations typically found in art education will not only help to shift learners’ attitudes about ecological concerns, but may prove to be more effective than traditional cognitive-based approaches in changing learners’ environmental behaviours to more sustainable ones. Art education has proven to be fertile soil in which to grow creative approaches to problem-solving, critical thinking skills and self-reflexive learning, all necessary for making our communities healthier and happier places. It achieves this by making learning personal, in part through developing and balancing learners’ visual, spatial, emotional and kinetic forms of intelligence, but also by giving them communicative tools to share their individual perspective. It is this ability - to connect learners’ minds with their hands and their hearts - that makes art education a powerful ally in fostering ecological literacy. In turn, place-based education has much to offer art education. Its roots in environmental education bring a wealth of experience in developing awareness of and engagement with environmental concepts such as biodiversity, conservation, preservation, reclamation, restoration and sustainability. It has experimented with how to raise public consciousness around these issues in both formal and informal education settings, from schools to conservation areas. It can help learners make connections by bringing self and community into a dialogue with place, resulting in real world learning that is experiential, memorable, and central to the themes of their lives. The field of art education has a lot to learn from the extensive body of writing about place-based education that has been published in recent years, seen in the work of Orr (1992), Sanger (1997), Gruenewald (2003), and Sobel (2004), amongst others. Art education has been slow to engage with and respond to the community-based challenges of our times, including social and environmental problems. While artists have been devising creative solutions to social and environmental problems since the 1970s, art educators for the most part have not kept pace, and have not done enough to share this type of socially relevant art with a broader audience. I am not the first art educator to recognize the potential for integrating place-based education with art education. Over a decade ago Blandy and Hoffman (1993) called for “an art education of place” in its content and in its pedagogy (p. 23). This makes sense as learners can use their local community as a source of imagery and inspiration for all aspects of art education: art-making, art history, art criticism and aesthetics. Yet this is a far cry from the way in which many learners are taught about the visual arts today. Fed a steady diet of art for art’s sake, studio techniques, colour theory, and Old Masters artworks, it is no surprise that many students become alienated from the visual arts in the early years of their elementary education. Learners are often not given enough understanding of the ways in which the visual arts (and the arts in general) can be used to develop a deeper understanding of themselves or their communities, or the ways in which the arts can be used to create meaning in their lives or bring about social change. I am cognizant that inherent in this line of thinking is a reconstructivist agenda, one that uses art education not only as a means for learners to explore and better understand themselves and the place in which they live, but also as a way to increase their emotional, social, and political engagement with their community. By developing their knowledge of and emotional attachment to their community, I believe that learners are more likely to develop a sense of connection to and stewardship towards their place, bringing about changes in attitudes and behaviours that would result in healthier environments and communities. Therefore I am advocating for an integration of place-based education with art education through the development of a model of place-based art education in my own practice as an educator, artist and writer. I am fortunate to be following the inroads made by others on this, as there is a rich and deep-rooted relationship between place2 and the visual arts. Artists have spent centuries recording and responding to the physical, emotional and spiritual aspects of their environments, yet over the past half century artists’ approaches to place have shifted and expanded exponentially, just as our knowledge and experience of place has grown. These contemporary artworks intrigue me more than traditional landscape paintings, as many artists are using place-based art-making specifically as a means to explore and address ecological issues and concerns. Artists such as Joseph Beuys, Hans Haacke, Alan Sonfist, Agnes Denes, Mel Chin, Ana Mendieta, Newton Harrison and Helen Mayer Harrison, Lynne Hull, Mierle Laderman Ukeles, Dominique Mazeaud, and Andy Goldsworthy, to name but a few, have been responding to place in innovative and imaginative ways over the last three decades. These artists have touched countless viewers through their work, both in terms of their understanding of place-related concerns and their ingenious means of proposing and communicating creative solutions to environmental challenges, reaching people in ways that scientists have been unable to do.3 For example, Joseph Beuys invited the citizens of Kassel, Germany to join in one of his art projects by planting 7000 oak trees in their community as a means of addressing global warming; in contrast Dominique Mazeaud spent seven years collecting litter and garbage from the banks of the Rio Grande river in Texas as an ongoing artistic stewardship project of her place. In another long term venture, Mierle Laderman Ukeles has been the artist-in-residence for the Sanitation Department of New York City for three decades as a means of raising awareness about excessive waste and consumerism in her hometown. As Watts (2005) describes them, these artists have “become advocates for communities, working as both co-learners and co-creators. Their work is collaborative and supports both natural and social ecosystems. Ecoartists can be thought of as midwives for the earth, facilitators of environmental education, consultants for environmental restoration and visionaries for transforming ecological communities” (n.p.). I agree with the potential that ecoartists artists bring to environmental education, but sadly these place-based works and their creators are a rich resource that have too often been neglected in both art and environmental education circles; place-based art education could provide a means to share them with a wider audience. A second text that provides foundational support for place-based art education comes from Blandy and Hoffman (1993). These authors see art as “a means to engage individuals in social and political issues in ways that empower them, create alliances, and establish community” (p. 29). They also make clear their specific agenda of defining and promoting “an art education of place” by focusing their attention on environmental concerns (p. 23). They see a direct correlation between increasing environmental degradation and the amount of ignorance about environmental issues, and therefore call on art educators to play a role in imagining “new relations among art, community and environment” (p. 23). As the basis for their approach, they turn to eco-theory and community-based art education for inspiration, but ultimately position an art education of place as a means “to teach students about art in a way that promotes an understanding of the interdependence and interconnectedness of all things” (p. 28). Other movements within art education have taken their inspiration from these authors, and therefore lend weight to the call for place-based art education; variants such as community-based art education5, urban art education6, and built environment education7 are the ones that are most closely aligned with the goals of place-based education. Place-based art education could serve as a solid meeting ground, one in which the features of these interests within art education could be developed, unified and advanced to simultaneously promote aesthetic awareness and ecological literacy; bringing together the voices of art and environmental educators means that they are more likely to be heard. Central to a successful integration of art and place-based education would be the development of a pedagogy appropriate for place-based art education. A useful resource in this regard is Sanger’s (1997) description of a three prong approach to place-based learning, which is useful in its simplicity and applicability to any discipline or artistic endeavour: build connections, build community, and use narratives. Building connections for him implies an experiential, interdisciplinary approach to learning that develops students’ skills, confidence and understanding of the value of their place. Building community entails using cooperative learning strategies by involving all members of a place in the process of education. Using narratives means listening and learning from the stories of the community members and the land and the ways in which they are intertwined. Smith (2002) reaffirms these ideas and emphasizes the value of a constructivist approach; he advocates for students to be become creators, not just consumers, of community knowledge, with teachers acting as guides or facilitators in this process. He feels that students’ questions and concerns should play a central role in determining an interdisciplinary curriculum. These fit well with existing art education pedagogies. Simpson (1995), Cunha Bastos (2002) and Campbell (2001) all propose similar pedagogies for art education programs that focus on specific environments. Neperud (1997), Lankford (1997) and Garoian (1998) also advocate for a pedagogy that is community-based, interdisciplinary, experiential, interactive, dialogic, ideologically-aware, and built on the values of empathy, sustainability and respect for the environment. Keifer-Boyd (2002) adds to this by bringing an eco-feminist perspective to the table. She writes of the need for a “participatory, socially interactive framework” that would emphasize caring for symbiotic relationships within a specific place over the long term (p.333). She would like to see artistic processes “denoting life cycles and interrelationships, rather than products of a permanent nature,” as well as a focus on “local, ecological and social transformation rather than beauty, ownership and economic gain” as the main rationale for art-making (p. 333). These ideas are long overdue in art education circles, and a welcome addition to place-based learning. These types of pedagogies and place-based content are being utilized in other art education programs in North America. 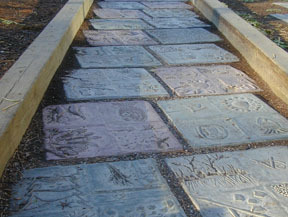 Birt, Krug and Sheridan (1997) described the artistic and scientific investigations of the local pond by students at Pickerington Elementary School in Ohio, resulting in a mosaic installed on site to share their learning with other visitors. Holmes (2002) outlined an interdisciplinary program that had adolescent learners drawing, painting and sculpting as a means to explore the ecology of a local river. Eco-artist Lynn Hull led a program in West Texas that involved observations, research and artworks made specifically for the wildlife of the Playa Lake area by college students (Keifer-Boyd, 2002). More recently, I have witnessed two successful examples of place-based art education in the schools and community centres in inner city environments in Toronto. In the Neighbourhoods program, the Toronto District School Board has funded residencies for visual artists to work with elementary students to examine their sense of place in their local communities. These explorations result in large-scale children’s art projects, often permanently installed in schools, which investigate and celebrate aspects of their own communities and cultures. These programs might see students going on walking tours of their neighbourhoods, researching their local history and cultural traditions, talking with community elders, and sharing stories of their own experiences. The results have been as unique as the communities themselves: mixed media murals on school walls; paintings collaged with photos and remnants of the students’ own clothing; large, hand-drawn aerial maps of their communities; and multi-layered quilts that symbolize aspects of community life. In a similar initiative, Arts for Children of Toronto, a local non-profit arts organization, organizes arts programs in socio-economically-challenged neighbourhoods, using local community centres as a means to involve children in drumming circles, drama clubs and art projects. Local artists inspire students to look more closely at their communities and consider how they can play a positive role in social change. Their most recent project uses TTC buses as moving galleries for mural paintings created by youth, providing a way for their messages about their communities to be shared both locally and city-wide. These programs provide evidence that ideas about place-based art education are filtering from journals and conferences into classrooms and community centres (and vice versa,) where they are taking root and growing on their own merit. But these efforts are only sporadically reported on and shared, making it difficult to cultivate a wider circle of art educators utilizing place-based approaches. Up until last year there were no comprehensive texts available for art educators to learn about place-based approaches, however with the publication of Art for Life (Anderson & Milbrandt, 2005), this may start to change; this is a substantial new resource that promotes place-based education as one aspect of “authentic instruction” in art education (p. 7). In my own research I have been experimenting with place-based art education programming and pedagogy over the last eight years through workshops, seminars and summer institutes, devising ways to introduce this approach to teachers and teacher candidates. My challenge lies in how to promote this concept in such a way so as to see the effects of pre-service and inservice learning translate into teachers’ own classrooms. (I am not alone in this, as this mirrors a similar challenge experienced in environmental education in general: how to get teachers to change not only their attitudes but also their teaching behaviours when conducting environmental learning). With teachers, bringing about curricular and pedagogical change requires a complex combination of knowledge-building, increased self-efficacy, and removal of barriers to implementation. To find this balance, my current research project has engaged a team of elementary teachers in a collaborative action research project to design art lessons to develop their students’ ecological literacy. Many questions drive our work: how can eco-art education be manifested in elementary classrooms? What role does place-based learning play in this? What challenges do they face in designing and implementing these types of lessons and programs? And do they believe the benefits of eco-art education outweigh its disadvantages? We have met over the course of a year to share ideas, inspirations and resources, brainstorm solutions to challenges and document our experiences. Perhaps not surprisingly what has resulted from this study has been many place-based art lessons. These teachers turned to their school yards, the local shopping strip, and neighbouring parks for materials, themes and images – in one case even turning their school’s butterfly garden into an art gallery! This resulted in drawings and a large scale mural of the community for one school, and a “Solution to Pollution” video in another (full of interviews with local residents, eco-music, place-based artworks and news spots about environmental issues of concern to these primary students). For yet another, it resulted in a series of nature-based art installations for the school grounds, created as a way to address stewardship issues in their own back yard – woven tree baskets, ice sculptures and wool and wood sculptures. Overall the teachers have been very positive about their curriculum development in this area, finding few challenges (other than inclement weather) and experiencing many benefits. They have been enthusiastic about their students’ high level of engagement in these projects and the depth of learning that has emerged from their experiences. As one wrote, “my involvement in this action research project has validated my commitment to the environment, to not always choose the beaten path. It has validated my choices in how I live my life, where I draw my inspiration, and what I model for my children, both at work and at home. It has inspired me to take more action” (K. Goodfellow, personal communication, June 22, 2007). The results of this study will be shared through images and lesson plans on a website next year as a means to inspire other teachers to try place-based art education in their own classrooms. At present I am at another crossroads, looking for the next direction(s) of where place-based art education may lead me. Whatever the route, I know that I will continue to explore how to move from the theoretical to the practical, working directly with new and practicing teachers to make multiple roadmaps of place-based art education for elementary classrooms. I suspect, however, that this path will not be without its share of unexpected twists and turns, and can only hope that the journey will help me to better understand and articulate my place in developing ecological literacy through the intersection of art and environmental education. 3 For more information on their work, refer to the exhibition cataologues of Matilsky (1992) and Spaid (2002). 5 Advocates of community-based art education are natural allies for place-based art education. London (1994) articulates a vision of art education that calls for a “cåurriculum more responsive to the world of the child [by] broadening the arena of education to include the people, places, and events of the entire community” (p. xi). Cunha Bastos (2002) concurs, adding that community-based art education offers a more democratic approach to art education, for “studying art made in local communities means that students and teachers can gain insight into the economics, politics, education and culture of their place,” (p. 71). 6 Urban art education also aligns well with place-based art education. Its proponents (Simpson, 1995; Thurber, 1997; Asher, 2000; Holloway & Krensky, 2001) have argued that art education is too often given short shift in urban schools, and yet it can help learners better understand and cope with challenges central to inner city environments, such as poverty, violence, drugs, and underemployment. Given the emphasis on learning in natural settings found in traditional approaches to environmental education and outdoor education, place-based art education could better support these students and their teachers in seeing the wonder and positive qualities of their own communities, as well as working actively towards making them better places to live aesthetically, physically and environmentally. 7 Built environment education increases learners’ awareness of local surroundings, of the influences that shape built and natural spaces, and of the need to participate in shaping their place in the future (Adams, 1999). Bringing its expertise with teaching about built environments into a place-based model would help to balance the traditional emphasis on the natural world in discussions of place, thereby creating a more holistic vision of what place and community are all about. 8 In an ideal world, this program would only be a start of these students’ learning about this watershed. This program helps them to connect to this part of their community in an affective, creative way, and could form an engaging starting point for scientific, historical and cultural explorations of the same site. Due to limited outdoor education budgets in the local school board, it is left up to individual teachers to follow through on these types of activities once they return to their own classrooms. Adams, E. (1999). Art and the built environment: A Framework for school programs. In J. Guilfoil (Ed. ), Built Environment Education, (pp.184-193). Reston, VA: National Art Education Association. Anderson, T. & Milbrandt, M. (2005). Art for life: Authentic instruction in art. New York: McGraw Hill. Asher, R. (2000). The Bronx as art: Exploring the urban environment. Art Education, 53(4), 33-38. Campbell, S. (2001). Shouts in the dark: Community arts organization in rural schools with ‘urban’ problems. Education and Urban Society, 33(4), 445-456. Cunha Bastos, F.M. (2002). Making the familiar strange: A community-based art education framework. In Y. Gaudelins and P. Spiers, (Eds. ), Contemporary Issues in Art Education, (pp. 70-82). Upper Saddle River, NJ: Prentice Hall. Ellis, J. (2002). The importance of attending to children and place. International Journal of Educational Policy, Research, & Practice, 3(3), 69-88. New genre public art, (pp. 74-87). Seattle: Bay Press. Holloway, D. & Krensky, B. (2001). The Arts, urban education and social change. Education and Urban Society, 33(4), 354-365. Holmes, S. (2002). Creative by nature: integrating the arts into environmental science education. Green Teacher: Education for Planet Earth, 69, 23-28. Keifer-Boyd, K. (2002). Open spaces, open minds: Art in partnership with the earth. In Y. Gaudelins and P. Spiers, (Eds. ), Contemporary Issues in Art Education, (pp. 327-343.) Upper Saddle River, NJ: Prentice Hall. Lindholdt, P. (1999). Writing from a sense of place. The Journal of Environmental Education, 30(4), 4-10. London, P. (1994). Step outside: Community-based art education. Portsmouth, NH: Heinemann. Matilsky, Barbara. (1992). Fragile ecologies: Contemporary artists’ interpretations and solutions. Neperud, R. (1997). Environmental design in community contexts. In J. Guilfoil, (Ed. ), Built Environment Education, (pp.27-36). Reston, VA: National Art Education Association. Simpson, J. (1995). Choices for an urban art education. Arts Education Policy Review, 96(5), 27-30. Smith, G. (2002). Place-based education: Learning to be where we are. Phi Delta Kappan, 83(8), 584-594. Thurber, F. (1997). A site to behold: Creating curricula about local urban art. Art Education, 50(6), 33-39. Tuan, Y. (1977). Space and place: The perspective of experience. Minneapolis, MN: University of Minnesota Press. Working Group on Environmental Education. (2007). Shaping our schools, shaping our future: Environmental education in Ontario’s schools. Toronto: Ontario Ministry of Education.